Laparoscopic colon resection in patients with situs inversus totalis: Is it the same operation as in patients without situs inversus totalis? Situs inversus totalis (SIT) is a rare congenital condition in which thoracic and abdominal organs are found anatomically on the opposite side. There are several different types of situs inversus in which the anomaly can be found only for the thoracic or the abdominal organs. In most of the patients, the current condition does not cause any symptoms. If a person with SIT is sick for any reason, diagnostic difficulties may be encountered if this condition is not known beforehand. Imaging tests reveal the situation. Surgical procedures in patients with SIT can be challenging because it is needed to perform these techniques on the opposite side. This difficulty manifests itself in laparoscopic procedures, especially colon resections that have been seen rarely. In a patient with SIT, performing laparoscopic colon resection may not often lead to the same ease of performing the surgical steps in a patient without SIT even by an experienced surgeon. Thus, emphasising the technical issues can allow the standardisation and technically hassle-free laparoscopic surgeries to be performed in patients with SIT. In this case, it was aimed to present laparoscopic anterior resection and its technical features applied to a patient with SIT due to recurrent diverticulitis attacks. 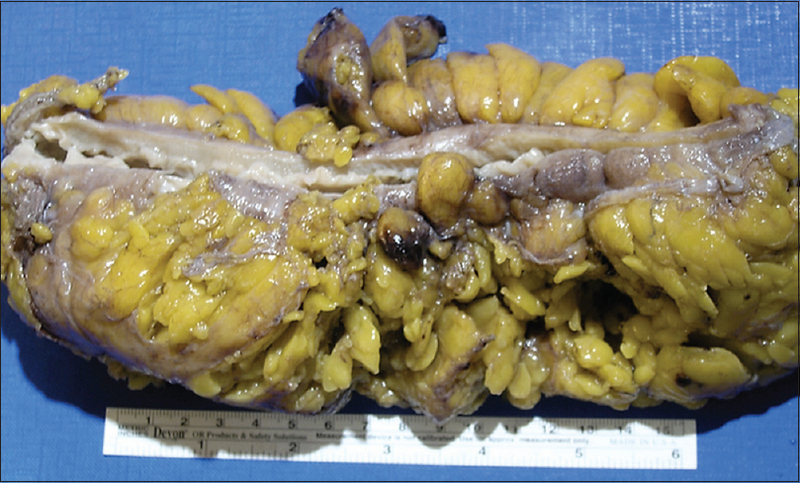 A 45-year-old male patient with recurrent sigmoid colon diverticulitis attacks was evaluated for surgical treatment. His previous history revealed that he had four diverticulitis attacks for the past 2 years. Hinchey Type Ib sigmoid colon diverticulitis with small (<2 cm) pericolonic abscess was seen in computed tomography during his last admission. He was also found to have SIT on his resume. After medical treatment, the presence of multiple diverticula on the sigmoid colon at the right lower quadrant was confirmed [Figure 1]. Due to recurrent and complicated colonic diverticulitis, it was planned to perform elective laparoscopic anterior resection. Written consent was obtained from the patient. Under general anaesthesia at lithotomy position, pneumoperitoneum was performed with a Veress needle from the supraumbilical area in which a 10-mm trocar was placed for the camera. When the abdomen was explored, the liver and the spleen were located at the left and the right sides of the abdomen, respectively, in accordance with SIT [Figure 2]. Due to the presence of the sigmoid colon in the lower right quadrant, a 12-mm trocar was placed in the left lower quadrant for stapler use under the camera view [Figure 3]. The other 5-mm trocars were inserted from the left middle quadrant and right middle quadrant. The sigmoid colon located on the right side of the abdomen was lifted and dissected from medial to lateral, like the mirror image of the classical anterior resection. The inferior mesenteric artery and vein were dissected and ligated by laparoscopic clipping. After the dissection of the mesentery, the distal part of the sigmoid colon was separated by an endostapler introduced from the left-sided 12-mm trocar (Endo GIA stapler, Covidien, USA). The specimen was removed from the suprapubic Pfannenstiel incision [Figure 4]. Under the laparoscopic view, an end-to-end anastomosis was performed with the circular stapler (31 mm, EEA, Covidien, USA). The oral diet was started on the 1st post-operative day. The patient was discharged on the 5th post-operative day without any complication. It has been seen that there were limited number of the articles as only case reports in relation to advanced laparoscopic surgery in patients with SIT. The number and placement of the trocars in this study were similar to that of Davies's et al. and Kobus's et al. cases., However, Jobanputra et al. inserted a 12-mm trocar from infraumbilical area and three 10-mm trocars from the left quadrants. A study by Jobanputra et al. also used bilateral ureteral catheterisation for the safety of the dissection. Yaegashi et al. interestingly used the similar trocar placement as in standard laparoscopic colon resection. However, an additional 5-mm trocar was inserted from the left lower quadrant. They also offered to change the position of the surgical team at the time of pelvic dissection and anastomosis as an alternative approach. In the light of such data, it has been concluded that some modifications may be performed during laparoscopic anterior resection in patients with SIT according to the decision of the surgeons. In previous publications, it has been mentioned that experience of the laparoscopic surgeon is required for the safety and feasibility of surgical treatment in patients with SIT., Therefore, it has been thought that laparoscopic experience of the surgeons may be the most important factor for the success of such modifications. Laparoscopic surgery in patients with SIT has some technical nuances such as management of 10 mm or larger instruments by previously used hands of the surgeons. During laparoscopic left hemicolectomy, surgeons usually use endostapler and clipping instruments via right hands due to their location on the right side of the patients. However, the opposite situation is the case in patients with SIT. In these cases, surgeons are forced to use their opposite hands for endostapler and clipping instruments. Laparoscopy is not a relative or definite contraindication for patients with SIT. Furthermore, it has been believed that it is a good treatment choice in appropriate patients. Although there are some technical differences between surgeons and surgical teams while performing such operations, it can be performed successfully by a well pre-operative planning and preparation. The surgeon and the assistant should be at the left side of the patient as in the laparoscopic right colon surgery, and the trocar placement should be the same to the mirror image of standard sigmoid colon surgery. During dissection, clipping and use of laparoscopic instruments including stapler by the left hand of the surgeon may be a limiting factor for right-handed surgeons. Although it has been thought that laparoscopic colon surgeries with and without SIT are the same operations except for their opposite sides (the mirror image), there can be important difficulties due to the inability to perform some surgical manoeuvres that the surgeon is familiar. In this case, the surgeon's dominant hand is passive, and the non-dominant hand is active during the operation. Therefore, the experience in advanced laparoscopic surgery may be considered as an important factor to decrease these technical problems. Laparoscopic colon surgery may be regarded as a safe and feasible modality in patients with SIT if it is performed by experienced surgeons. Davies H, Slater GH, Bailey M. Laparascopic sigmoid colectomy for diverticular disease in a patient with situs inversus. Surg Endosc 2003;17:160-1. Kobus C, Targarona EM, Bendahan GE, Alonso V, Balagué C, Vela S, et al. Laparoscopic surgery in situ s inversus: A literature review and a report of laparoscopic sigmoidectomy for diverticulitis in situ s inversus. Langenbecks Arch Surg 2004;389:396-9. Jobanputra S, Safar B, Wexner SD. 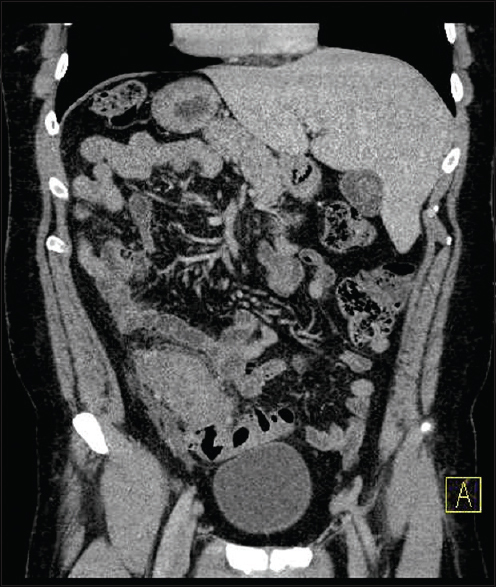 Laparoscopic diverticular resection with situs inversus totalis (SIT): Report of a case. Surg Innov 2007;14:284-6. Yaegashi M, Kimura T, Sakamoto T, Sato T, Kawasaki Y, Otsuka K, et al. Laparoscopic sigmoidectomy for a patient with situs inversus totalis: Effect of changing operator position. Int Surg 2015;100:638-42. Yaghan RJ, Gharaibeh KI, Hammori S. Feasibility of laparoscopic cholecystectomy in situ s inversus. J Laparoendosc Adv Surg Tech A 2001;11:233-7. Stojcev Z, Duszewski M, Bobowicz M, Galla W, Maliszewski D. Laparoscopic cholecystectomy in a patient with total situs inversus – Case report. Pol Przegl Chir 2013;85:141-4. Martínez ML, Redondo PV, Gatica JC, Angel JM. 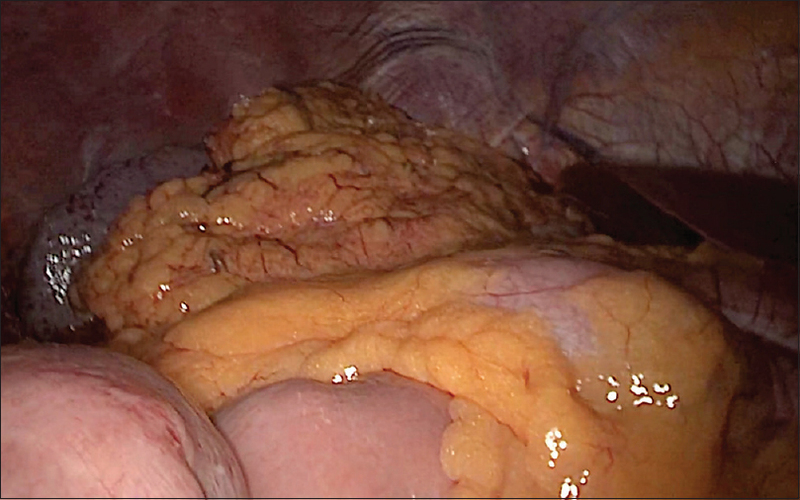 Laparoscopic hemicolectomy for a patient with situs inversus totalis and colorectal cancer. J Coloproctol (Rio J) 2017;37:147-51.